The Laser Ranging Retroreflector is a device that reflects light back to Earth. This experiment consisted of an array of fused silica cubes, arranged to reflect a beam of light back on a parallel path to its origin. The LRRR placed on the Moon was aligned precisely so that it faced the Earth. Scientists directed laser beams at the instrument which reflected them back to Earth. The elapsed time for the round trip permitted precise measurements of distances between the Earth and the Moon-to within 8 centimeters (3 inches). This instrument continued in operation till June 1981. This device contained four seismometers powered by two panels of solar cells, which converted solar energy into electricity. The experiment measured lunar shock waves caused by moonquakes or impacts of meteoroids or of manmade objects on the surface. Data regarding the strength, duration, and approximate direction of the seismic event were relayed to receiving stations on Earth. The seismic instrument package continued sending data for about a month after the Apollo 11 landing. The seismic experiments left on the surface by the crews of Apollo 11 and five later Apollo missions continued to return valuable information even after the end of the Moon landings, with the last one being shut off in 1981. Apollo 11 astronaut Buzz Aldrin stands just to the side of the passive seismic experiment, in the foreground of the picture. He has just finished deployment of the instrument. 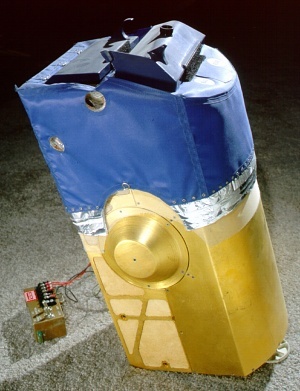 The Laser Ranging Retroreflector (LRRR), U.S. Flag, television camera and the Apollo Lunar Surface Closeup Camera ALSCC and Lunar Module are visible in the background. This image was taken at Tranquility Base during the Apollo 11 Mission. A third experiment, a Solar Wind Composition Experiment (SWCE) was deployed on the Moon by the Apollo 11 astronauts. This experiment was also repeated later by astronauts on Apollo 12, 14, 15, and 16. The experiment consisted of an aluminum foil panel, similar to household foil, that collected atomic particles released into space by the Sun. The purpose was to determine the chemical composition of solar wind. Scientists from Switzerland created and provided the experiment for the Apollo program. After deployment on the Moon, it was returned to Earth by the crew for analysis. After the mission, scientists in Switzerland analyzed the exposed foil, showing world-wide participation in the Apollo program. SNAP stands for Systems Nuclear Auxiliary Power. 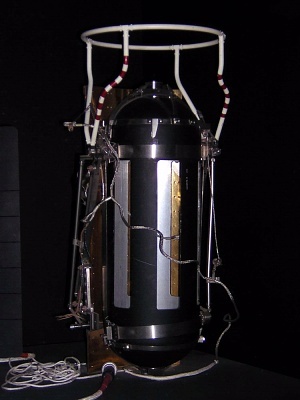 The SNAP-27 radioisotope thermoelectric generator is one of several atomic-powered electric generators developed jointly by the National Aeronautics and Space Administration and the Atomic Energy Commission. It is fueled by plutonium-238. The fuel capsule, containing 3.8 kilograms (8.36 pounds) of fuel, was carried to the Moon in a separate Fuel Cask attached to the side of the Lunar Module. The fuel cask provided thermal insulation and added structural support to the fuel capsule. On the Moon, the Lunar Module pilot removed the fuel capsule from the cask and inserted it in the RTG. 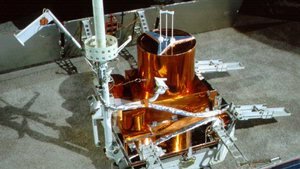 The SNAP-27 Radioisotope Thermoelectric Generator (RTG) converted the heat energy from radioactive decay to electrical energy. 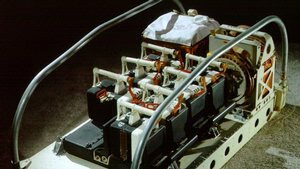 Five such RTGs provided electric power for the Apollo Lunar Surface Experiment Packages (ALSEP) left on the Moon by Apollo 12, 14, 15, 16 and 17. 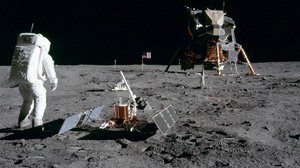 These stations transmitted information about moonquakes and meteor impacts, lunar magnetic and gravitational fields, the Moon's internal temperature, and the Moon's atmosphere for several years after the missions. 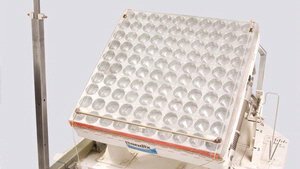 After ten years, a SNAP-27 still produces more than 90% of its initial output of 70 Watts. Isotopes are forms of an element that are chemically the same but have different atomic masses. Some isotopes are unstable. Unstable isotopes can be radioactive-they radiate energy and eject particles from their nuclei until they reach a stable form. For instance, an atom of plutonium-238 radiates a helium nucleus 2 protons and 2 neutrons -- to become uranium-234. The collisions of these helium nuclei with the walls of the fuel chamber heat the inside of the SNAP-27 to 600°C (1100°F). This heat is converted to electrical energy by the thermoelectric element. When two different conductors are placed in contact, electrons flow from one to the other if the energy levels of the electrons are different in the two materials. The higher energy electrons cross the junction until the energy levels are the same on both sides. The principle is the same as charging a battery. If the conducting materials are connected in a loop, equal numbers of electrons will cross both junctions from the higher to the lower side, creating equal but opposed voltages. Since there is no net voltage, no current flows around the loop. A thermoelectric element is such a loop made from two conductors whose energy levels change at different rates when the temperature changes. If the junctions are not at the same temperature, there are unequal differences in energy levels across the junctions. Thus, unequal numbers of electrons have to cross the junctions and unequal voltages are established. Since there is a net voltage around the loop, a current will flow. The SNAP-27 has 442 thermoelectric elements. The hot junctions are heated inside the RTG. The eight vanes of the radiator cool the cold junctions to 275°C (530°F). Alan B. Shepard cast his shadow over the Apollo 14 SNAP-27 as he photographed the Apollo Lunar Surface Experiments. In the background is the central relay station, which transmits data from the sensing instruments to the Earth. 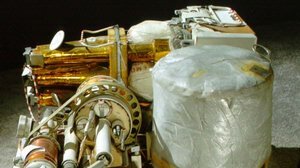 The Apollo 17 ALSEP was packed on two subpallets similar to the ones shown here. Energy for the ALSEP was provided by the nuclear-powered Radioisotope Thermoelectric Generator (see SNAP-27 above). The last experiment ceased working in December 1974. 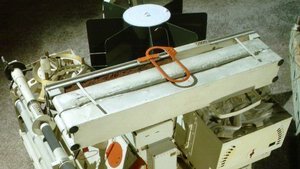 The Heat Flow Experiment was designed to measure the heat distribution and transfer in the lunar soil. To do this, two different instruments were used. First, the astronauts used an electrically-powered drill to create holes as deep as 4.6 meters (15 feet) into the lunar surface. Next, two probes, called bore stems, were inserted into the holes drilled by the lunar surface drill. 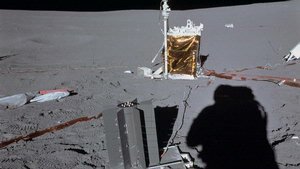 As part of the heat flow experiment, the probes collected various measurements of heat distribution and transfer in the lunar soil. This pallet was part of the ALSEP Seismic Profiling Experiment and held eight separate explosive devices of varying strength. The astronauts carried the pallet on the Lunar Roving Vehicle and deployed individual seismic explosive devices at various intervals around the lunar surface. After the astronauts departed the surface and returned to lunar orbit, they detonated the charges remotely by radio signal. A seismometer on the ALSEP then recorded the seismic behavior of the lunar surface and interior. The Surface Gravimeter, or Traverse Gravimeter, was an instrument designed to measure and map the gravitational field of the Moon. 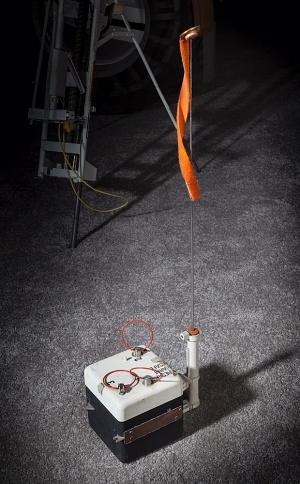 It was mounted on the Lunar Roving Vehicle and used a vibrating string accelerometer to measure gravity fields. The crew read the data to Earth-based scientists.